In 2018, we’ve said goodbye to a president and his beloved; a preacher who elevated us and a scientist who brought the cosmos down to Earth; a celebrity chef and a movie heartthrob; and the Queen of Soul herself. Join us as we look back at notable lives lost this year. We lost a Hollywood icon when Burt Reynolds, star of “Smokey and the Bandit” and “Deliverance,” died, and he was one of many of our favorite actors who took their last bow this year. Memories of loveable sitcoms came flooding back after the deaths of “Frasier’s” John Mahoney, “The Facts of Life’s” Charlotte Rae, “Coach’s” Jerry Van Dyke, and “M*A*S*H’s” David Ogden Stiers. We loved to hate Katherine MacGregor when she played Harriet Olesen on “Little House on the Prairie,” and we haggled alongside “Pawn Stars” patriarch Richard Harrison. Soap opera fans are missing Peggy McKay, who stepped away from a 33-year run on “Days of Our Lives” just two years before her death. And fans of Hollywood glamour remember Tab Hunter, a big screen heartthrob of the 1950s and ’60s, and Margot Kidder, who played the perfect Lois Lane alongside Christopher Reeve in the 1978 “Superman” and its sequels. When former First Lady Barbara Bush died in April, we mourned her loss and sent strength to her husband, former President George H.W. Bush. When the 41st president died just seven months later, we were comforted to think they were together again. Another pillar of U.S. politics lost this year was Senator John McCain, who represented Arizona for three decades and was a headline-maker throughout. On the international level, Kofi Annan served as Secretary-General of the United Nations and won a Nobel Peace Prize. 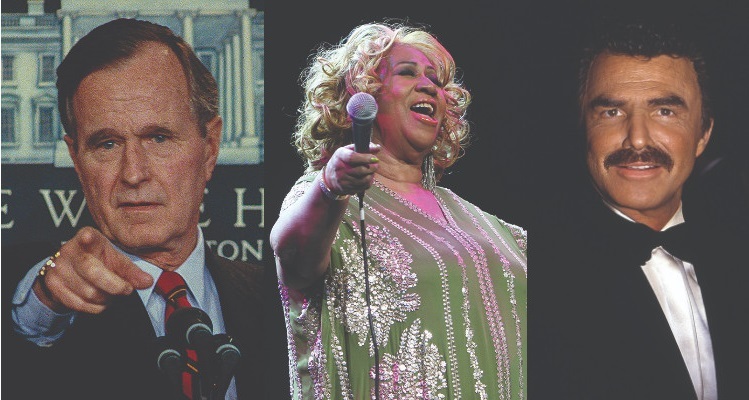 People who shaped our culture in all kinds of ways died this year, from the Rev. Billy Graham, the prominent minister who counseled presidents, to Stephen Hawking, the brilliant theoretical physicist who brought us a better understanding of the universe even as he battled ALS. Two of NASA’s Apollo astronauts, John Young and Alan Bean, were among the only human beings ever to set foot on the Moon, while Paul Allen revolutionized home computing when he co-founded Microsoft. Winnie Mandela fought for freedom in South Africa as an anti-apartheid activist. Ingmar Kramprad created a new kind of shopping experience when he founded IKEA; Charles Lazarus brought joy to the masses as founder of Toys R Us; and Kate Spade influenced our personal style with her iconic handbags. Bruno Sammartino, known as “The Strongest Man in the World,” was one of the all-time greats of professional wrestling. Stan Mikita was named one of the 100 greatest NHL players after his 20-year career with the Chicago Black Hawks. And Rusty Staub was one of the original stars of the Montreal Expos. Discover more life stories at Legacy.com.